Horrible officiating! The flagrant foul, the charge and the travel on the game winner. Three blind mice. I'm extremely fortunate. My wife of 35 years and I graduated from the Univ. of Iowa in the early 80's. Over the years we have watched from afar most all Hawkeye football and basketball games on TV. I lost interest in watching the Hawkeye BB team when they had their Tony Benford type era. It was her that pushed me back into watching the games again. In 2007 our son was an invited walk-on to play for the Mean Green football team so we had another school to follow. Over the last eleven years she has only missed maybe five home games. While he was playing we went to most all road games and since he graduated we usually go to at least one road game a year. 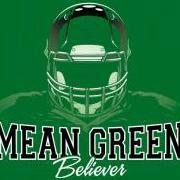 We have renewed for our second season ticket year of Mean Green BB. She often listens to non televised Mean Green road games on her phone while doing yard work. She enjoys regularly going to the Rudy's Coaches Football Show. We liked coming up to Denton from Carrollton so much that we bought our future retirement home in Denton last year. When we moved in our TV room was already painted green so she obviously called it "The Green Room" and that name has stuck. In five days we will be in "The Green Room" to watch the Hawkeyes at 230 PM then change from black & gold to green clothing and head over to Apogee. Like I said, I am extremely fortunate! The replay of the blocking foul clearly showed Lockett used his left forearm to push off so it should have been a charge. I had Michaels frame my son's home and road UNT jerseys. Although it was expensive at around $250 each, they did a very good job. I sat in those bad seats two years ago. This time I bought much better seats from Stub Hub. My wife and I will attend. Hoping the Mean Green will be much more competitive than the trip to Kinnick Stadium in 2015. Can't decide if I root for Iowa which is our alma mater or the Mean Green where our son played. A win for the Mean Green might be the biggest win of all time for the program while it would be devastating for the Hawkeyes. Over the last two seasons I have seen him play around eight games for Hebron. He is very talented and definitely looks like a D1 QB. This past season he was the Offensive MVP in district 5-6A. It would indeed be huge if he flips from KU to UNT! Did the Jimmy Show get canceled? As the coaches and players from UTKFC & UNT were shaking hands in the middle of the field as the game ended and then the Mean Green players were headed toward the student side, I noticed one lone Mean Green player walking down near the south goal line headed to the locker room. It was #22 Jimmerson. To separate from the celebrating team right after the first win of the year clearly says something is wrong. Without a doubt Carlos is a very talented player and certainly gives full effort each and every game. My son was on the team from 2007-2011 which included Coach Canales' first interim stint. If my son had choose to ignore a Social Media ban that Canales also announced to the public in his press conference then I would have been extremely disappointed and upset with my son. My son will be wearing green. My wife will be wearing black & gold. I will be wearing black & gold with not a sewn together cap but rather a green Hawkeye cap. My wife, son and I will be at Kinnick Stadium. Been looking forward to this game at my wife and my alma mater for a long time. Really proud of you to receive this award! Definitely Garage Wall of Fame Material!